Because my husband and I are from Wisconsin, we’re diehard Packer fans. However, right now our entire family is enjoying a fling with the New Orleans Saints. My second cousin (the son of my first cousin) has become a key player his rookie year as a New Orleans Saint and teams like the Broncos are kicking themselves for not signing him. He’s Ryan Ramczyk, Offensive Tackle, #71. We’re all just a little proud! In celebration, I’m sharing this low carb jambalaya recipe that’s been killing it lately with my clients. 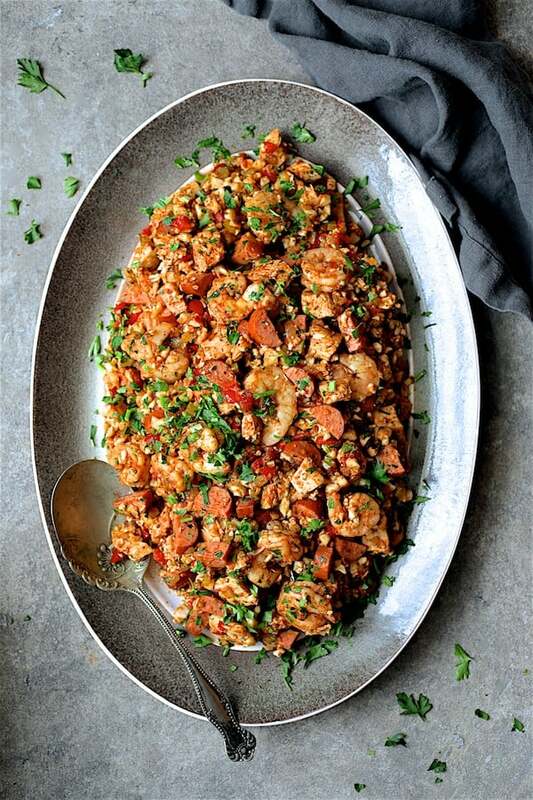 My classic Jambalaya with Chicken, Shrimp and Sausage recipe made with white long-grain rice has been a client favorite for a long time. However, as with most people, my clients want healthier alternatives to their favorite dishes. 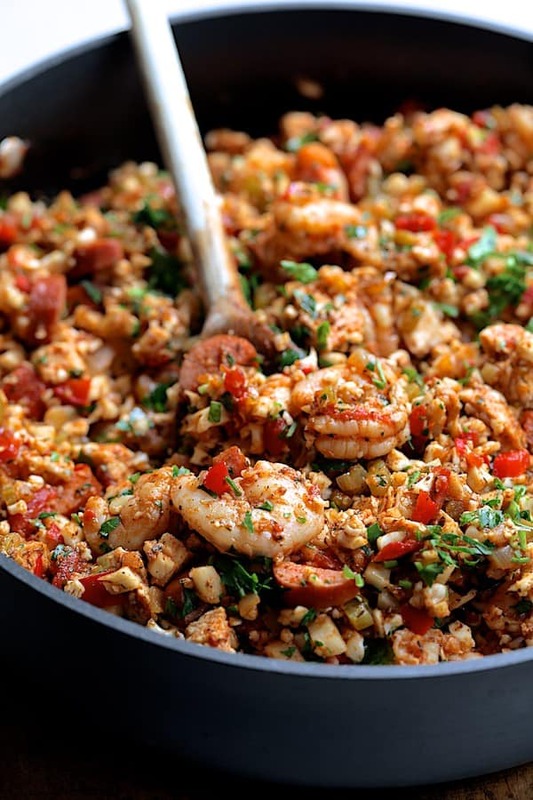 This New Orleans classic is made with cauliflower “rice” instead for a low carb jambalaya. Thank you to the genius who created cauliflower “rice!” Like my cousin’s son, cauliflower is rocking it right now. Years from now we’ll look back on this time as the “cauliflower revolution” because cauliflower is everywhere! If not hand-chopping the cauliflower, opt for packaged cauliflower “rice” (also known as “pearls”) if at all possible. If you process cauliflower florets in a food processor, it’s difficult to get them uniform and you run the risk of over-processing them. Cauliflower has a lot of water in it which can turn your “rice” into a mushy mess in no time. A bag is not that much more expensive than a whole head; save heads for roasting, salads, soups, etc. Hand-grating the cauliflower is going to give you a better result but it’s tedious. Oh, yes! 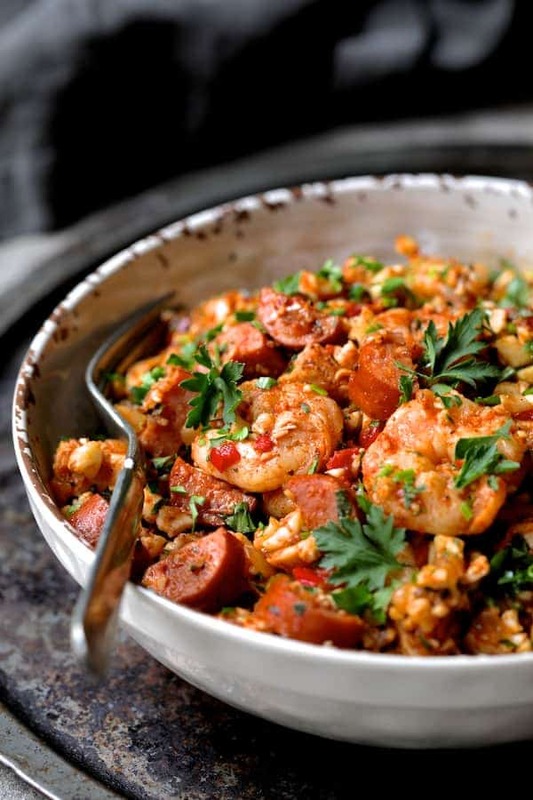 You’ll be saying laissez le bon temps rouler with Low Carb Jambalaya with Chicken Shrimp and Sausage! 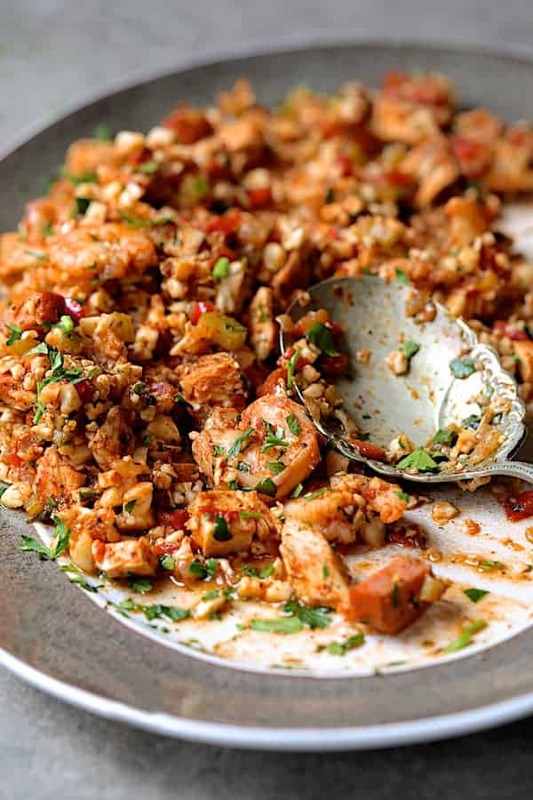 Low Carb Jambalaya with Chicken, Shrimp and Sausage is a healthful and nutritious twist on the New Orleans classic that's made with cauliflower "rice." Preheat oven to 375 degrees. Place chicken breasts on a nonstick baking sheet. Drizzle with 1 tablespoon olive oil. Season evenly with salt, pepper and 2 teaspoons Cajun seasoning. Bake for 22 - 25 minutes or until cooked through to 165 degrees. 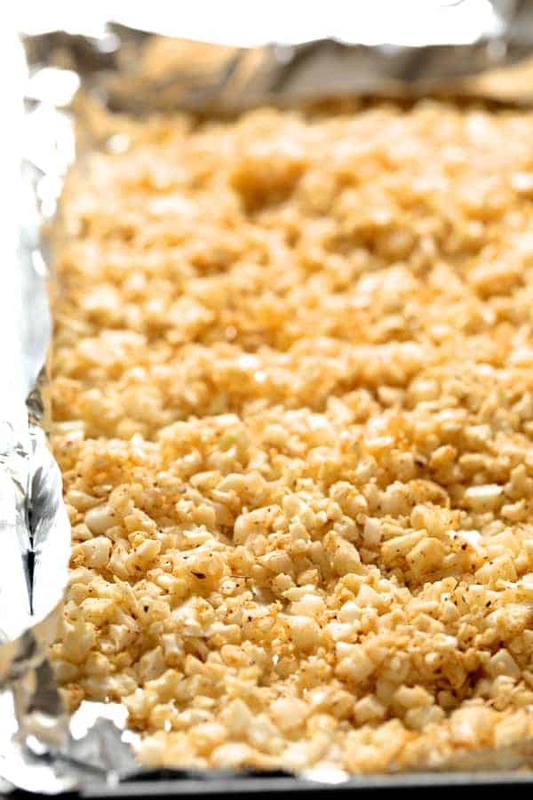 Place cauliflower on a nonstick baking sheet (or line a baking sheet with nonstick aluminum foil or parchment paper). Drizzle with 1 tablespoon olive oil and season with salt, black pepper and 1 teaspoon Cajun seasoning. Toss so that seasonings are evenly distributed. Roast for 10 minutes alongside the chicken. Meanwhile, heat remaining 2 tablespoons oil in a large skillet or saute pan over medium-high heat. Add the onion, reduce heat to medium and cook 4 - 5 minutes. Add the celery and red bell pepper and continue cooking another 7 - 8 minutes or until very soft. Keep heat at medium. Add the garlic, paprika, Andouille sausage and cook 2 minutes. Add tomatoes and shrimp and cook, stirring often until shrimp is cooked. Cut the chicken into 1/2-inch pieces. Add to pan along with cauliflower and heat through. Adjust seasonings and add Tabasco sauce to taste. Add half the parsley. Transfer to a serving platter and garnish with remaining parsley. Made this tonight for dinner and hubby said, “it’s excellent”! And I must say it was! Flavor was amazing! Will definitely make this again! Thanks for a great recipe! Hi, Maya, Thanks so much! So glad you both enjoyed! Question….I have raw chicken andouille sausage. Do I cook it before adding it? Hi, Elaine, Thanks for your question. Because its ground, I would definitely cook it first following the package instructions. Thanks again and hope you enjoy! I made this last night and it was absolutely delicious. The only change I made was to use chicken thighs (my preference) and Andouille chicken sausage (all I had). I doubled the recipe without a problem. Baking the cauliflower rice is brilliant! I might add chopped scallions as a garnish next time. Thank you for a great recipe! Thank you, Karen! I’m so happy you enjoyed and chicken thighs would be perfect, too! Andouille chicken sausage would also be great–most likely healthier! My life was forever changed when I discovered doing cauliflower rice in the oven so I’m so glad it’s working well for everyone else, too! Thanks again! Thank you so much, it’s delicious and….. GO PACK GO!!!!! Thanks so much, Jennifer! So glad you enjoyed! Looks like the Pack is having to regroup but New Orleans is still going strong! Thanks again! Thank you so much for this recipe!! It was beyond delicious! Also, I will never make cauliflower rice any other way! Thanks again! Hi, Jennifer, Thank YOU so very much! I was having kind of a rough day and you just made my whole day! Roasting/baking the cauliflower rice makes all the difference. Thanks again and so glad you enjoyed! Hi, Cailyn, Thanks so much for your question. I’ve made this for personal chef clients who required it be frozen and it did okay. 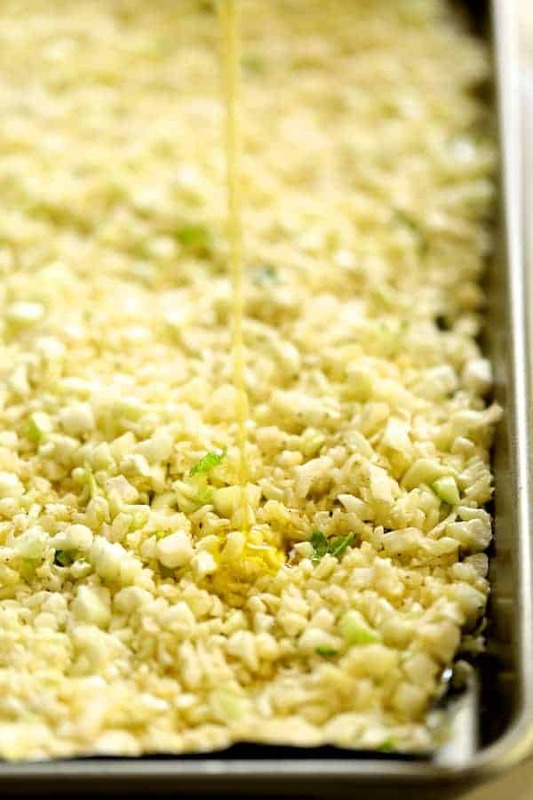 Because the cauliflower “rice” gets roasted/baked, a lot of the water will have evaporated. It’s the water in vegetables that’s a problem after a dish has been frozen. Also, be very careful to not overcook the shrimp. I highly recommend using wild-caught shrimp; it has a better texture than farmed and holds up better. When you heat the jambalaya, I suggest doing it in the oven and covering it. Thanks again, hope you enjoy and please let me and my readers know how it went. Hi, Maria, What a wonderful compliment! Thanks so much and glad you enjoyed! Thank you so much, Suzanne! So glad you enjoyed! Doing the rice in the oven really does make a world of difference. Thanks again and please stay in touch! This was great! Made two 12 oz bags of cauliflower rice and added extra time in oven. Will definitely use that method again! Did not add paprika because my cajun seasoning was so spicy and all I had was hot smoked paprika. Didn’t want to send it over the edge. I used 1+ lb chicken thighs and 12 oz shrimp also because I was feeding 6. Made it for my sister and her family. She asked for the recipe. LOVED IT. It took some time but was not hard to make. The result was worth it! Will make again – I like jambalaya but dislike that it’s low in veggies. This solved the problem. Thank you! Hi, Kim, So glad you enjoyed! Roasting/baking the cauliflower rice really does make all the difference in the world; it’s the only way to go! Thanks again and please stay in touch! I’m a busy mom. Could I just throw all of the ingredients in the slow cooker and add the shrimp at the end? Hi, Jessica, Thanks so much for your great question! I don’t think doing it in the slow cooker would work very well. With all the water that cauliflower has, I think you could end up with a soupy mess. Any time I’ve done cauliflower “rice,” I watch it closely because it overcooks so fast. I’ve always had the most success doing it in the oven on a sheet pan. I have done this dish for clients and they reheat it so I know that works. What about getting it all cooked and when your family is running in all different directions, they could just reheat it in small portions in the oven or toaster oven? You just have to be careful to not overcook the shrimp in the first place. I also highly recommend using wild-caught shrimp as it seems to be way more resilient than farmed shrimp which, to me, gets rubbery quickly. Thanks again and if you do try it in the slow cooker, please check back in and let me know how it went. Hi! I can’t seem to find the Nutrition information on this for my carbs app. Can you tell me where they are located? Hi, Kerrie, Thanks so much for your question. I had to disable the nutrition information feature on the recipe program I am currently using because it was throwing off erroneous information. Nutritional information calculators are seldom accurate. I would suggest using the Self [Magazine] Nutrition Data so you can enter the information on the products you’re using. Thanks again and hope you enjoy! The portion size in this recipe isn’t listed and not helpful when watching your diet. Would you be able to exact it? Thanks. Flavor is great but don’t want to be overindulging. Hi, Brenna, Thanks for your question! I indicated 4-6 because cauliflower “rice” is lighter and some people may eat more. For the very average person, I’d estimate 2 cups per serving. Thanks again and glad you enjoyed! Low carb dieter here. Looking for a jambalaya recipe for Mardi Gras. Followed your recipe exactly. Love it! My son wants it in our monthly dinner rotation it’s so good. I added more hot sauce to my bowl because I like it spicy. Just letting you know that I appreciate the work you put in to help out families like mine. Well done! Linh, Thank you so much! You absolutely made my day and maybe even my week! So happy to hear that you and your family enjoyed this so much! Please stay in touch! Thanks, Eileen! We’re all pretty proud. And to think he almost went to technical school for welding! This looks delicious! But… I don’t see the recipe. Am I missing a link or is the recipe not displayed? It’s back! I will be upgrading the program I use for recipes for a better user experience and installed it moments ago. It overrode what I am currently using. Thanks and hope you enjoy!